"Darwin" & "Huxley," the two opposing college football team, are named after the originator of the theory of evolution, 19th century naturalist Charles Darwin, and his leading advocate, biologist Thomas H. Huxley. Harpo Marx was one of only two of The Marx Brothers to play a recurring role in their films (not counting when they used their own names). He played the role of "Pinky" in both Horse Feathers and Duck Soup . A scene in which all four of The Marx Brothers play a poker game as the university burns to the ground around them was filmed but cut. According to Groucho Marx, when Thelma Todd fell out of the boat he kept rowing as she cried for help not knowing she really couldn't swim. Crew members got her out of the water. Although the present running time (68 minutes) is very close to that of the original (70 minutes), there are still a few bits and pieces and lines of dialogue missing, due to re-editing in 1935 in order to bring the film up to Production Code standards. Apparently the only surviving material also contained some splices which lop of lines of dialogue and bits of action, particularly in the sequence in Thelma Todd's apartment involving the blocks of ice. Another brief gag was cut from the speakeasy scene, in which Harpo stood up on the bar and bowled beer bottles with a grapefruit. In the last half of the movie Chico Marx is limping. During the making of the movie, Chico was in a car accident and his kneecap was shattered. Professor Wagstaff's exclamation, "Jumpin' anaconda!" is actually a reference to a company, Anaconda Copper, whom Groucho Marx had invested in heavily. When the stock market crash of 1929 occurred, Marx lost several hundred thousand dollars, hence the curse word in the movie. 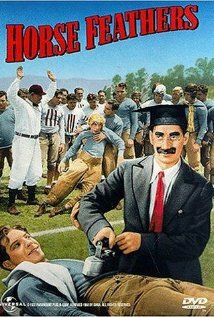 Several comedy routines in the movie were taken from the Marx Brothers' 1920's vaudeville stage show, "Fun In Hi Skule". When Groucho Marx is broadcasting on the radio, the man next to him at the typewriter is Groucho's friend/writer Arthur Sheekman.